signs (2014) : sam wolk. For 8 speakers and variable number of screens. Created in conjunction with a fixed audiovisual composition for 40 loudspeakers and 2 channel video. This piece was presented on the HYDRA 40-Loudspeaker Orchestra in John Knowles Paine Hall on December 10th, 2014. The installation and composition were both deep explorations of beat frequency phenomena through the use of fixed frequency oscillators or continuously-modulated oscillators, respectively. 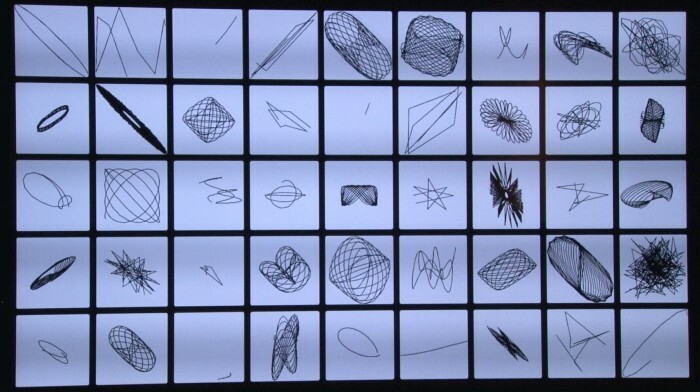 The installation iteration of "signs" presented at HUSEAC 33 was created using 8 loudspeakers, 45 digital oscilloscopes, and roughly 500 sine waves. Each speaker individually received audio from its own set of 14 sine wave oscillators. Each set would correspond to a roughly 20 Hz bandwidth fixed around a certain center frequency, e.g. 200 Hz. 6 oscillators would be spread throughout the bandwidth, e.g. at 200 Hz, 200.3 Hz, 201 Hz, 203.6 Hz, 208.7 Hz, 211 Hz, 215.3Hz. The differences between these fixed frequencies immediately generates a complex albeit static rhythm of beat frequencies through the constructive + destructive interference of the oscillators. The last 6 oscillators would be paired up with each of the first 6 oscillators, however with their frequency separated by differences on the order of .001-.009Hz, e.g. at 200.005 Hz, 200.3001, 201.003 Hz, 203.607 Hz, 208.702 Hz, 211.005 Hz, 215.309 Hz. Because the differences between these oscillators and their matches fall within .001-.009 Hz, the period of the amplitude modulation that they generate with their match would be within 100 seconds - 1000 seconds. This then has the effect of fading the matched oscillator in and out over the duration of a single period of this beat frequency cycle, which in turn means that the beat frequency relationships between the first set of oscillators is constantly evolving. As such, what was a static yet complexly pulsing rhythm generated by the first set of 6 oscillators is now a constantly evolving rhythm that never repeats due to the highly prime relationships between the different beat frequencies. The 8 speakers then form a massively pulsating, droning "chord" through the 8 frequencies they are centered around and the pulsations at each frequency. Over time, the harmonic emphasis of the chord evolves as different speakers become more prominent based on the sorts of rhythms emerging through the interactions of the oscillators at that speaker, while others recede into the background. Furthermore, one can wander around the room to focus in on just a single speaker, or the subset-chord which a certain set of speakers might form. Finally, the images on the screens are generated by using many digital oscilloscopes to not just faithfully represent various combinations of sine waves at their X and Y inputs forming complex lissajous patterns, but also to further mutilate those lissajous figures using capabilities of a digital oscilloscope not available in the analog domain.